Former President Jimmy Carter said in a new interview he wished NFL players who protest during the national anthem would find a "different way" to demonstrate rather than kneeling. 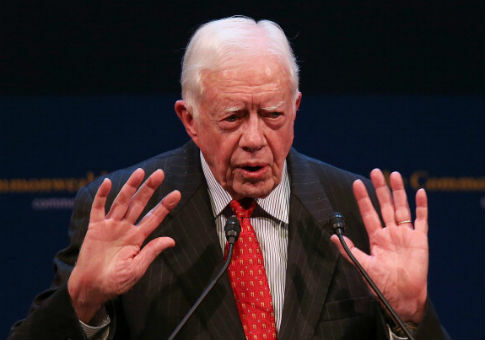 In an interview with the New York Times‘ Maureen Dowd, Carter sounded off on various topics, and the former Democratic president said he wanted to see players stand for the anthem. "I think they ought to find a different way to object, to demonstrate. I would rather see all the players stand during the American anthem," Carter said. Kneeling or sitting during the national anthem began with NFL quarterback Colin Kaepernick last year as a protest against police brutality and racial injustice. It attracted widespread media attention, and soon some other players were doing the act as well, although the vast majority still stood. President Donald Trump then seized on the issue last month, saying at a rally that NFL owners should fire players who don't stand for the national anthem. Vice President Mike Pence left an Indianapolis Colts game on Oct. 8 after some San Francisco 49ers players didn't stand, leading to criticism that it was a planned White House stunt. Carter was surprisingly defensive on behalf of Trump in the interview with Dowd, telling her that the media is "harder on Trump than any other president certainly that I’ve known about." When asked whether Trump had helped sour the country's image in the world, he said the problem predated him. "Well, he might be escalating it but I think that precedes Trump," Carter said. "The United States has been the dominant character in the whole world and now we’re not anymore. And we’re not going to be. Russia’s coming back and India and China are coming forward." This entry was posted in Politics and tagged Donald Trump, Jimmy Carter, NFL. Bookmark the permalink.